We are here to help make your NPD a success. ICAN coordinates the NPD effort statewide as an effort to get kids and families all across Indiana to jump start their summer with nature play. We want kids to connect with the outdoors around them and hopefully discover new places to play and organizations like yours near them! ICAN will lead promotional efforts to publicize NPDs and manage the statewide NPD listing online. You've registered a NPD so you understand the importance of outdoor play but many people do not. ICAN has a variety of resources available to families to help them connect with the outdoors. We hope you can make ICAN part of your event and share ICAN resources with your attendees. Together we all rise-- and get kids outdoors! Tools to enhance your event and integrate ICAN are below (logos, social media promos). Additionally, a Resource Packet is available for those new to event planning or looking for additional support. 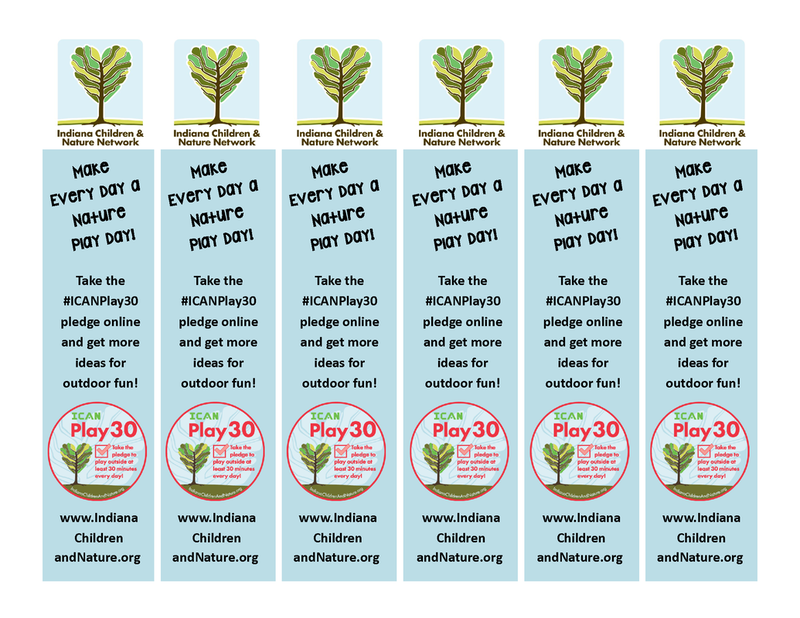 A limited supply of #ICANPlay30 pledge stickers and other decals are available and can be requested below. Please "like" ICAN on Facebook, Instagram, and Twitter and tag us in your events and postings. Create a Facebook event for your NPD and add ICAN as a host. This helps us find your events for crossposting and sharing on the ICAN social media. The Host Resource Packet contains info to help you organize a successful Nature Play Day. This packet is primarily geared toward those hosts who might be new to event organization but there is helpful info for all enclosed. Learn about NPD organization including special considerations, how to recruit volunteers, activity ideas for all types of outdoor locations, partner/sponsor info and talking points, event promotion and social media, and post event suggestions. We hope you can integrate ICAN into your event. As we build a statewide network to get kids outside, it is important that families and communities are introduced to the resources ICAN has available to them. Please post or hand out ICAN flyers, brochures, #ICANPlay30 stickers and other ICAN items as you are able. 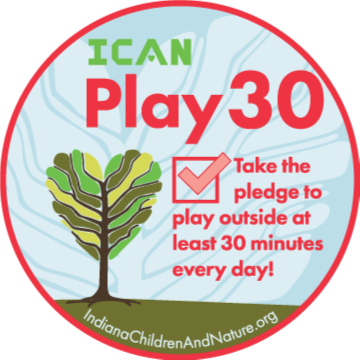 We encourage you to use our logo on your promotional items and flyers and have participants take the #ICANPlay30 pledge. Items are available for download below, we hope to secure funds to make printed copies available to you as we are able. Post/hand out this flyer at your event to incorporate ICAN and the #ICANPlay30 pledge. Includes outdoor scavenger hunt. Type your event info into this fillable pdf and post to spread the word! Print and cut these bookmarks to pass out at your event! Invite people to come play! Add your event info and post at your event site ASAP! Please do not distort or alter the images in any way. Please display in full color or black and white. PSD files available upon request. A word document with the logos is available by clicking here. Encourage your event participants to share the fun on their social media feeds. ICAN's social media banners and photo frames make fun props for your event! Check out some blogs and media coverage of organizations finding success with NPDs! Share the fun with the NPD hashtag!